Charleston Balloon Company has expanded into a retail facility with a storefront and production space. The grand opening will be held Monday, Nov. 20 from 6-8 p.m. The balloon shop, owned and operated by Jill Shortreed, previously operated out of space in their home. “By expanding into a shop with a storefront attached, it allows the customer who maybe doesn’t want a full-blown service but wants an element of what we do to come in and pick it up or place an order for delivery,” Shortreed says. Originally from New Jersey, Shortreed and her husband, Scott, operated a party store there. In 2004, Scott, who works for the U.S. Postal Service, was transferred to South Carolina, so the couple closed up their existing shop and moved to the Palmetto State in 2004. They didn’t intend to reopen a shop, but a couple of years after they moved, they had once again opened a party goods store. The pair closed up shop, liquidated the party goods, and re-branded into just a balloon company. They also made the business a home-based one, which it remained until recently. 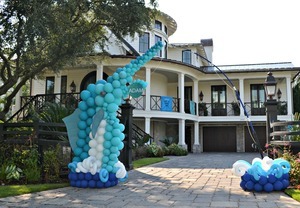 According to Pioneer Balloon Co., supplier of Shortreed’s balloons, there are approximately 450 balloon boutiques in the world, and Charleston Balloon Co. is the largest one in North America. It’s tied for fourth largest in the world. Having a storefront will only help increase business. The new facility also has a production window to give clients a view of projects currently under production. “Kids get a kick out of seeing the balloons being blown up in the back,” Shortreed says. The company utilizes Qualatex balloons from Pioneer, a staple for professional balloon decorators due to their durability. And durability is important – Shortreed says that weather is the company’s biggest challenge. If, for instance, Lowcountry winds are strong, Shortreed may make a design change for safety reasons, or she will discourage clients from picking black balloons for an outdoor event in August. Shortreed says that fall is typically the company’s busiest time, although in recent years business has been steady year-round. The company’s largest demographic has been corporate and nonprofit events, and Shortreed has worked with such companies as Harris Teeter, Benefitfocus, MUSC, and the Charleston County School District.